After being betrayed by her family and a witness to her brothers horrific ordeal, this precious little girl has been traumatized. I am a female, black and brown Miniature Pinscher. I weigh approximately 33.00 lbs. I am located at Animal Control Headquarters. I have been at the shelter since Apr 10, 2018. If you would like to rescue or adopt one of the animals listed above, please email rescue.coordinator@claytoncountyga.gov or call the numbers listed above. 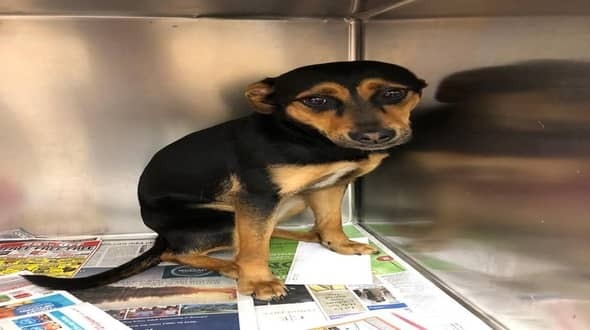 Fidonation, if you or someone you know is interested in giving this pup the forever family he rightfully deserves, please contact the CLAYTON COUNTY ANIMAL CONTROL at 770-477-3509, and reference the shelter ID #A001894. 1 Response to "6 months old Patty has nothing left in this world...and her world is terrifying"